Dr. Paulette Sanford has been in private practice since 1993. She is a graduate of the University of the Pacific School of Dentistry. Before becoming a dentist, Dr. Sanford was a full time, licensed, dental hygienist for seventeen years. Her desire for an advanced education and new and better technologies lead her to dental school. She continues to be very active in advanced dental programs, which allow her to keep current with the changing technologies and procedures of dentistry today. We will treat all patients like our own family would be treated. We will provide you with the skills and knowledge to help you keep and maintain your smile for a lifetime. We want you to have the smile you’ve always wanted. I grew up and then married into the military, so I have been to many dentists over my lifetime. Dr. Sanford is amazing! She explains everything in detail and makes sure you are comfortable. She even gave me a blanket last time I was in! I won’t go anywhere else. Teeth Whitening, Laser Dentistry, Under Armour Performance Mouthwear, Veneers, Fillings, Dentures, and more. 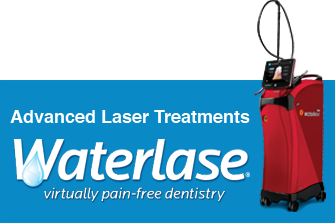 Our laser dentistry services provide amazing benefits and the latest in dental technology to our patients. We are conveniently located in front of Plum Creek Golf Course.